There is probably no Disney movie more apropos to having its own "land" in Tokyo DisneySea than The Little Mermaid. Mermaid Lagoon is entirely inspired by that movie. Mermaid Lagoon has two areas, an outdoor area and an indoor, "underwater kingdom" area that is home to the Little Mermaid (whose name is Ariel) and the rest of her pals. The exterior of the underwater kingdom is absolutely stunning. A fluid design accented by giant seashells, coral, and kelp, it is a structure befitting royalty. It is especially beautiful at night, when ever-changing light patterns and fiber optic special effects turn the structure into a show of its own. The inside of the underwater kingdom is nearly as beautiful as the outside. Brilliant use of lighting effects help set the mood, as you are surrounded by kelp and coral formations, glowing jellyfish, and other creatures of the sea. 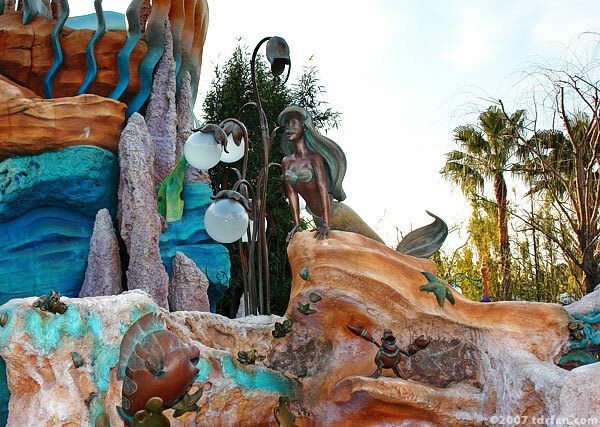 With one exception, the attractions in Mermaid Lagoon are nothing to write home about. Most are adaptations of your basic go-around-in-a-circle carnival rides. They are all beautifully themed, and the ones inside the underwater kingdom are thematically designed to integrate into their surroundings. However, it's obvious that this land is geared towards children, and those without children will probably enjoy looking at the attractions more than riding them. The one exceptional attraction in Mermaid Lagoon is not a ride but a show: the Mermaid Lagoon Theater. This live-action recreation of The Little Mermaid combines music with large-scale puppetry and flying-wire acrobatics. It will be enjoyed by folks of all ages, and is Mermaid Lagoon's must-see attraction.